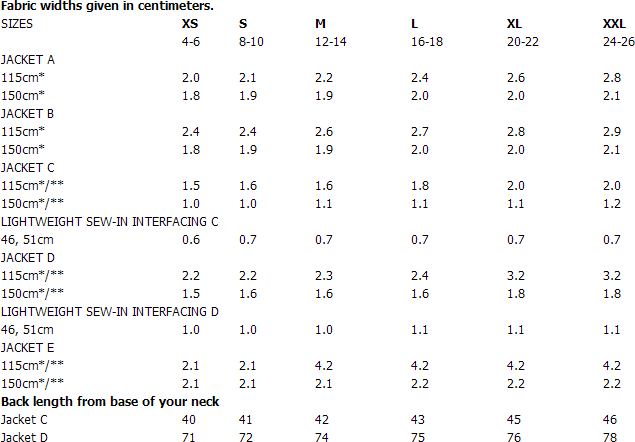 Loose-fitting jackets A, B, C, D, E with no closures. A, B: above waist, dolman sleeves, pleated drape. B: sleeve bands. 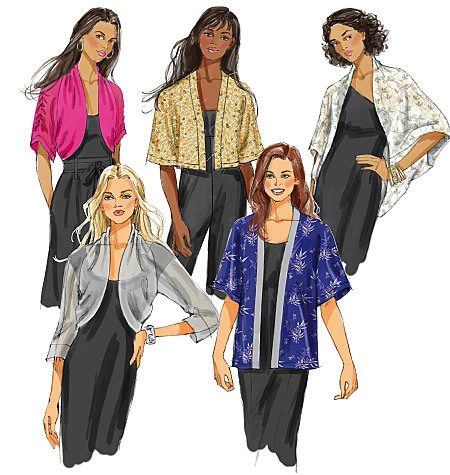 C, D: kimono sleeves, stitched hems. D: below hip, purchased ribbon trim. E: self-lined, above waist, optional edgestitching. Notions description...NOTIONS: Jacket A: 3/8 yd. of 1/4 inches Clear Elastic. Jacket D: 21/4 yds. of 11/2 inches Ribbon. Jacket A, B, C, D, E: Crepe, Sheer Fabric, Faille, Jersey, Lightweight Velvet and Jacquard. Also for C, D, E: Brocade.